Separation anxiety in toddlers is completely normal, but that doesn’t make it easy to handle. Maybe we’d like being able to spend 24/7 with out toddlers, but life isn’t like that; and if they would take our comings and goings with a happy, sunny face everything would be much more peaceful. Instead, he acts as if you are planning major abandonment every time you step out to get your nails done or have lunch with a friend. And that daycare you vetted so carefully, making sure it was the perfect safe haven for your little son or daughter? The way the child acts, it’s as if you’re dropping him off at a 18th-century poorhouse. It doesn’t feel normal, it doesn’t feel right, but separation anxiety in toddlers is no more than a phase that almost all toddlers go through. Some have it more severe than others; some have it in spurts, but it’s a regular part of growing up. Your toddler is learning to deal with the fact that you’re not a permanent fixture in his life, with a body separate and independent from his body, and when you leave he’s not absolutely entirely sure yet that you’ll always come back. Your child’s separation anxiety won’t last forever. Every child has their own timeline, but the worst of separation anxiety should be over before your child turns three. Think of it as growing pains as your child adjusts to a confusing, sometimes scary world. It’s not your fault your toddler is acting up, but there are things you can do to make it better—and there are some mistakes you could make to make the problem much worse. Here are some important do’s and don’ts when dealing with separation anxiety in toddlers. •	Join in on the cry party. 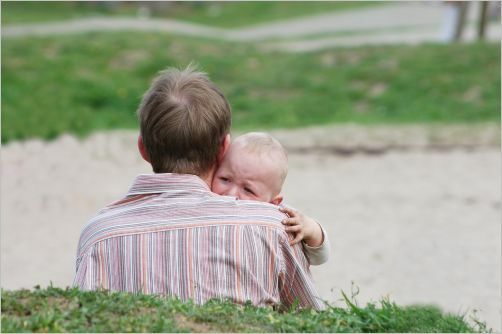 You may feel as if sharing your toddler’s tears and agitation, at least in a small measure, is empathetic, but it actually makes him feel much worse: if mommy is worried about leaving too, this must be a really major disaster! •	Scold unnecessarily. Your toddler isnt’ trying to be manipulative; he is simply expressing his feelings. Give him freedom to do that, setting boundaries if necessary. •	Resort to subterfuge. Sneaking away seems like the easy way out, but it’s hardest on your toddler, both today after he realizes you are gone and in the future. You’re teaching your child he can’t trust, and that’s a scary thing to teach. •	Let your toddler know exactly when you are going, where you are going (if appropriate) and when you will be back. Knowledge is power, and by giving him this basic information you are letting him feel a little more in control in his world. •	Plan for transition times by having a babysitter come a little earlier than you plan to leave; or going to daycare early so that you have fifteen minutes you can ‘be there’ for your toddler as he adjusts. •	Say goodbye when you leave, and encourage him to say goodbye and wave to you. •	Keep your attitude happy, upbeat and positive, even if your toddler is screaming and kicking a fit. Remember, he’s growing up each day; it won’t be long before separation anxiety in toddlers will be a thing of the past for the two of you. The day may even come (can you believe it?) that you miss the days he noticed when you left. So cherish him now, spend all the time together you can, and put on a brave face when you have to deal with separation troubles.